Chapter 1 provides a description and analysis of the global market for bags and sacks made of plastics or paper – including forecasts up to 2025. For every region of the world, figures (in tonnes) such as demand split by material and by application as well as amounts of production split by material are given. Chapter 3 analyzes the application areas of bags and sacks in detail: Data (in tonnes) on the development of demand in the application areas carrier bags, garbage bags and sacks, heavy duty and industry sacks, food packaging, as well as other applications. The indications are further split by material (plastic and paper). 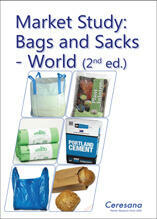 Chapter 4 takes a look at the demand (in tonnes) for bags and sacks split by the types of material polyethylene, other plastics (film), woven plastics, as well as paper.